Aquamarine, the birthstone of March, has a rich history and is the perfect accent for spring and summer wardrobes. Lots of people are a fan of the mesmerizing blue gemstone, even if they weren’t born in March, and we have all the info you need to know about the gorgeous birthstone if you decide to invest in aquamarine jewelry for yourself or a loved one. 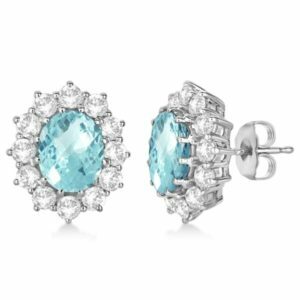 Oval Aquamarine & Diamond Accented Earrings 14k White Gold (7.10ctw) by Allurez. 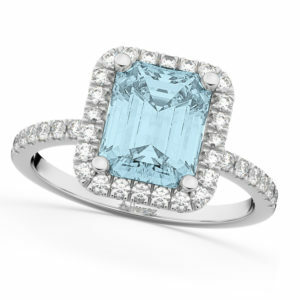 Aquamarine is actually a color variety of a mineral called beryl and iron gives it its vibrant blue hue. It grows in large, six-sided crystals that can be up to a foot long, making it a gem good for cutting and polishing into larger carats, which is desired in statement pieces of aquamarine jewelry. 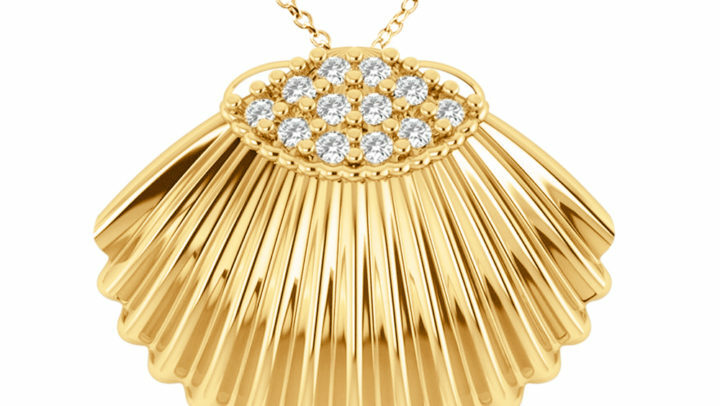 The gem is also used to celebrate 19th wedding anniversaries. Aquamarine ranks 7.5 to 8.0 on the Mohs Hardness Scale, making it a pretty durable gemstone. 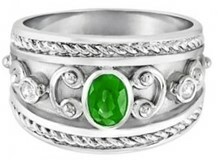 The gemstone’s hardness and transparency make it a popular choice for many people. Aquamarine’s preferred color is a moderately strong dark blue to slightly greenish blue and it’s generally accepted that lighter colored aquamarines are less valuable than the stronger, deeper hues of blue or blue green, according to the American Gem Society. 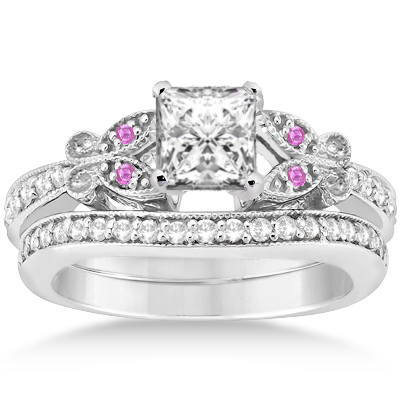 In terms of the stone’s clarity, most cut gems do not have inclusions that are visible to the naked eye, which makes it again a great choice for jewelry. Because aquamarine’s color is light, cutting is important and gems that are cut well show amazing brilliance, the American Gem Society noted. Aquamarines can be cut into almost any shape, but cutters often shape them as emerald cuts or as round or oval. If you wanna know about carat weight, aquamarine crystals come in sizes from very small to very large, with some even up to 100 pounds! 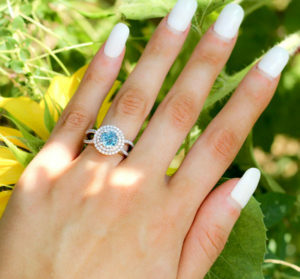 Large stones are difficult to use in jewelry however, so there’s less demand for them, except as center stones for aquamarine engagement rings and such. 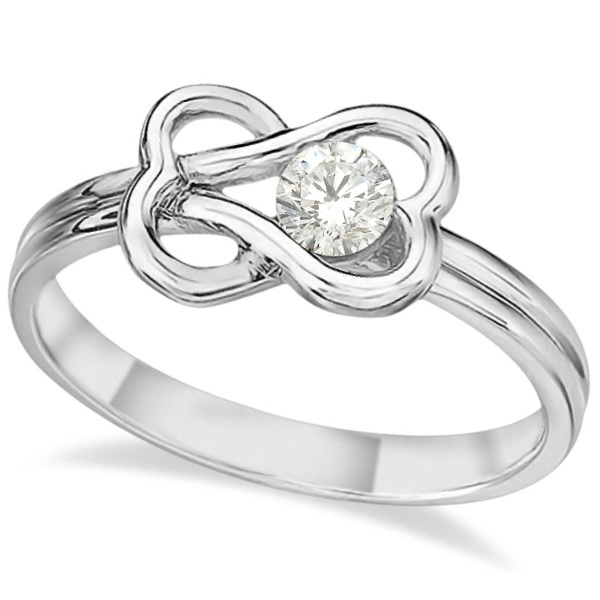 For that reason, per-carat prices for aquamarines tend to drop for sizes above 25 carats. 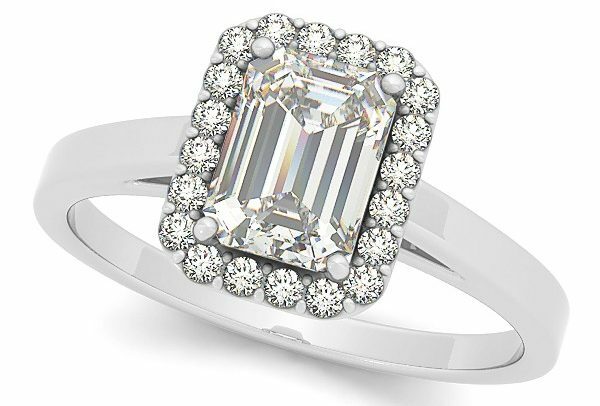 Aquamarine & Diamond Engagement Ring 14k White Gold (3.32ct) by Allurez. Aquamarine has long been a symbol of youth, health and hope. It’s name is actually derived from the Latin word “aqua,” meaning water, and “marina,” meaning the sea. The gemstone is mined mainly in Brazil, but also is found in Nigeria, Madagascar, Zambia, Pakistan, and Mozambique, according to the American Gem Society. The largest Brazilian aquamarine on record was found in 1910, in Minas Gerais, Brazil, and it weighed 244 pounds. Aquamarine is also found in central Colorado and became the state’s official gemstone on April 30, 1971, according to the Colorado state archives. 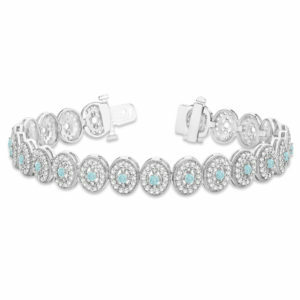 Aquamarine Halo Vintage Bracelet 18k White Gold (6.00ct) by Allurez. According to the American Gem Society, in the Middle Ages many believed that wearing aquamarine could literally cure someone of poisoning. Many ancient medicines incorporated powder from the aquamarine gemstone and it was believed to help cure all kinds of infection. It was said to be particularly good for any sort of eye problems. The Sumerians, Egyptians and Hebrews also believed aquamarine had powers, and the Romans believed that carving the shape of a frog into a piece of aquamarine jewelry would help to reconcile differences between enemies and encourage them to instead be friends. In addition, many warriors wore aquamarine in one way or another into battle, hoping that it would bring them victory, and sailors wore it to protect them at sea and ensure they have a safe voyage. 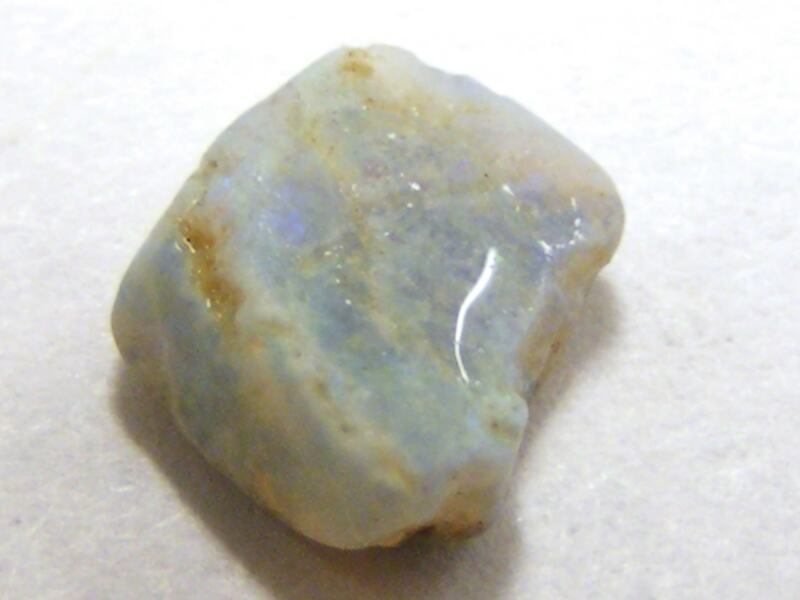 The stone is also believed by many to be good for mental health, help cultivate inner tranquility and cool ones temper, in order for them to remain calm and level-headed. 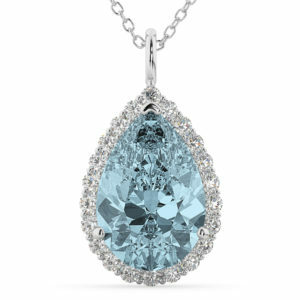 Halo Aquamarine & Diamond Pear Shaped Pendant Necklace 14k White Gold (6.04ct) by Allurez. One of the most famous aquamarine engagement rings was co-designed by singer Justin Timberlake for his now-wife, actress Jessica Biel. Timberlake proposed to Biel with a 6-carat diamond ring flanked by aquamarine stones and set in blackened platinum. 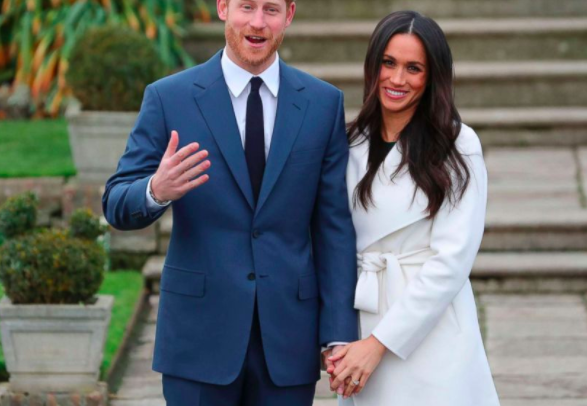 It was previously ranked the tenth best celebrity engagement ring of all time by Vogue magazine and the ring is estimated to cost at least $100,000. Timberlake included aquamarines in the design as a tribute to Biel’s birthday on March 2. Another famous aquamarine piece of jewelry was owned by the late Princess Diana, who had an aquamarine ring and bracelet set, and the Queen has a well-known set of aquamarine jewels that include a large tiara, necklace, earrings, and bracelet. One of Queen Elizabeth II’s largest tiara is The Brazilian Aquamarine Parure Tiara. It is also speculated to be one of her first and one of her favorites. The royal monarch’s love of aquamarines began with an aquamarine necklace and a pair of aquamarine earrings that were gifted to her in 1953 by the president of Brazil as a coronation gift. She later commissioned for a tiara to match the gift set and has repeatedly updated it over the years. First Lady Eleanor Roosevelt also received a large aquamarine from Brazil’s president in 1936.